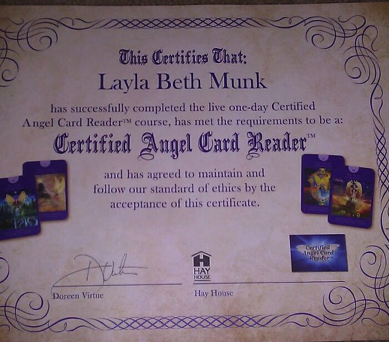 As you may already know, I recently became a Certified Angel Card Reader, by way of Doreen Virtue‘s Angel Card Reader program. Prior to my certification, I had become quite the devotee of Doreen’s Messages From Your Angels Oracle Cards. Over the last year-and-a-half of using this 44-card deck quite faithfully, I jumped at the chance to attend one of Doreen’s in-person certification classes! While this class focused on her “standard” 78-deck Angel Tarot Cards, she touched on numerous other decks, including my beloved Messages From Your Angels deck. She even covered how a reader can provide one reading, with several sets of cards, including oracle cards! I don’t know why, but that took the “sting” out of any lingering fear of Tarot I may have been holding on to. Now, LET me back up a minute: That “fear” I speak of was not, at all, based on anything religious. I never thought Tarot was evil, in spite of hearing as much, as a small girl. I had dabbled with Tarot over many years, but always got frustrated with it. I just wasn’t any good at it! It was simply too complicated. Still, though, Tarot wanted into my life! I have procured two decks of classic Tarot cards in my life, and both found their ways into my world under charmed circumstances. Both times, I just KNEW I’d learn Tarot, once and for all, and both times after a few days or weeks of keeping Tarot on the back burner in my brain, I walked away from the cards, yet again. (I will say, however, that the times I was committed enough to conduct an actual REAL reading for myself, dedicated to a REAL question, I got prompt and accurate guidance.) I simply walked away because Tarot was just too intimidating…or so I thought. Enter Ms. Virtue’s Angel oracle cards…my whole attitude towards card reading shifted dramatically. The methods for reading seemed less “strict” and not “scary” at all. (Swords? Towers? The HANGED MAN! ?”) I got pretty darn good with these cards and even did readings for friends. The messages were always compassionate and accurate. I was hooked! It’s true that these were “just” Oracle cards…maybe I needed to drop my Tarot-Guard and try the real deal, yet again? Long-story-short, upon first touch of the Angel Tarot, I was in love! The cards felt safe, and I loved how Doreen and co-creator, Tarot genius, Radleigh Valentine echoed my previous thoughts about Tarot. This was the full deck, yet every bit as compassionate and loving as the Angel oracle cards. I immediately opened my heart to the divine energy of Tarot and, in the course of that class, became 100% unafraid. I embraced my ability to learn and read Tarot, and haven’t looked back since! 3-card Angel Tarot Spread with “Bonus” Angel message reading ~ Results carefully explained and emailed to you. Text message with photograph of your spread included! A Distance Energy Healing session will be conducted as I perform the reading, if desired, as well. Introductory price: $20.00 donation. Traditional Celtic Cross Spread with 3-card Messages From Your Angels Spread ~ Results carefully explained and emailed to you. Text message with photograph of your spread included! A Distance Energy Healing session will be conducted as I perform the reading, if desired, as well. Introductory price: $30.00 donation. Soon, I will be offering additional Tarot / Numerology packages via my Etsy store! (Coming soon!) And the prices WILL go up…eventually. I will update this blog when these prices are no longer valid. For now, this price point and these offerings feel right to me. Thank you, and blessings for allowing me to be a part of this journey, with you.